Next weekend (Friday Sept. 24 and Saturday Sept. 25) will be an important meeting for AAUW of North Carolina. We expect at least 19 of our 20 branches to be represented. The board meeting begins at 3:00 on Friday and will adjourn at 5:00. Dinner will be at 5:30 and the suggested restaurants are Fatz Cafe and the Monesi Brazilian Buffet and , across Rte. 68 from the Hampton Inn, not at the Moose Cafe as previously announced. If you plan to arrive after the board meeting but in time for dinner, please make a note of this change. The more comprehensive discussions will start at 7:00 on Friday, reconvene at 9:00 on Saturday morning and adjourn by 3:00 on Saturday afternoon. Click the small map for a larger version or go to http://goo.gl/maps/7EUB for an interactive map. 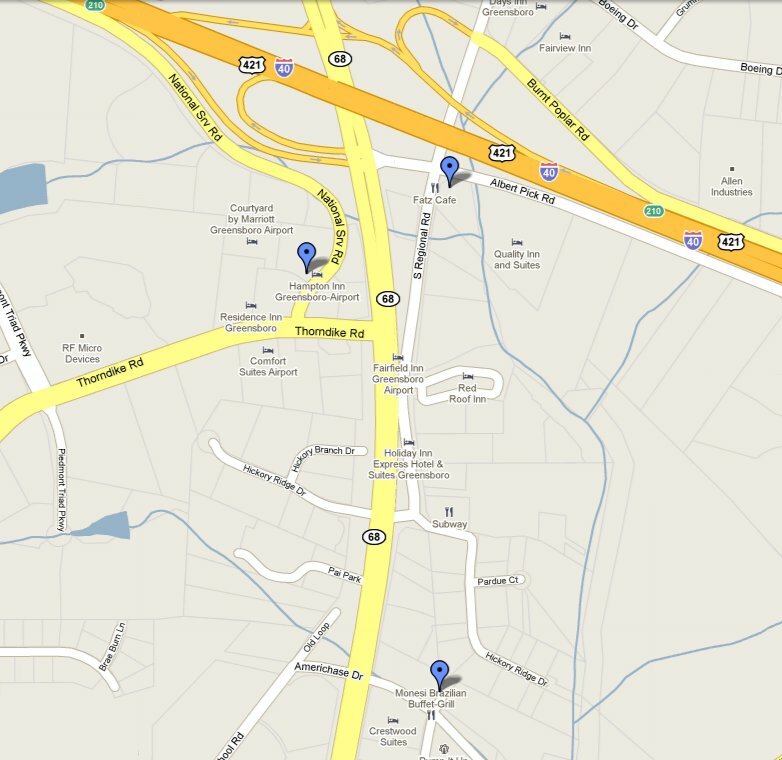 To Hampton Inn: Take I-40 Exit 210 to NC 68 South. Turn right on Thorndike Rd., and take an immediate right onto National Service Rd. From HI to Fatz: Take a left on Thorndike and a right onto NC 68. Take a left at the next stoplight onto National Service Rd. and follow it back to the left, towards I-40. Fatz will be on the right. From HI to Monesi: Take a left on Thorndike and a right onto NC 68. Go about .4 mile and turn left at a light onto Americhase Dr. Monesi is in the Sedgmore Center, next to Crestwood Suites.